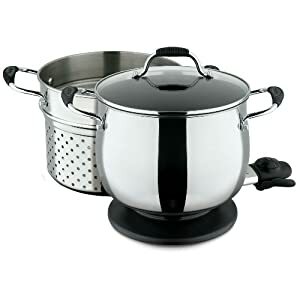 The Prestige A La Carte Electric Stainless Steel Stockpot is perfect for simmering soup, chili, stews, reducing stocks as well as slow cooking family-sized one-pot meals, plus the bonus pasta insert will cook perfect pasta too. This multifunctional unit performs a variety of cooking tasks, from cooking and keeping food warm to being used as an elegant serving piece. It is practical with a tempered glass lid that locks in flavours and nutrients while still allowing you to see through the glass lid to see how things are cooking. The variable temperature control allows the stockpot to heat up quickly and evenly also offering unlimited cooking options. One of the Stockpot's strengths is its ability to brown meat and veg before turning down the heat to cook things on a slow simmer, it can also keep food warm for long periods. As well as being stunning to look at it is easy to clean and the main pot being dishwasher friendly. On the negative side this Stockpot is quite large and may be difficult to store in a small kitchen, but then it does have a massive 7.5 litre capacity. 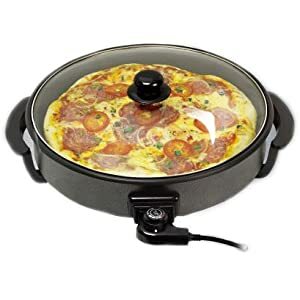 The Prestige A La Carte Electric Stockpot is a fantastic slow cooker and comes highly recommended, and would be a great addition to any large family kitchen. I have fisrt hand experiance with an electric frying pan which I will quickly share with you. Hopefully it will influance your desicion to buy the Andrew James 1500 Watt Multi Cooker. A few months ago some friends of ours moved into a new house. They had not long been married and things were tight, however someone had brought them an electric frying pan as a wedding present. The house they were renting did not come with a cooker and so their unused wedding present was a lifesaver. Anyway they started to rely on their new kitchen gadget but me being me was very secptical about how useful it would actually be in situations like dinner parties. It soon transpired that we were to be invited over to a curry night. Now with it being a couple of months after the move I wrongly presumed that the cooker situation had been resolved, how wrong was i? We arrived to the smell of a fantastic indian curry being cooked in an electric frying pan. Sadly they had not yet got the money together to sort out the cooker situation but to be honest this in no way hampered the evenings meal. Ok so they had a small disaster with the rice in the microwave but the main part of the meal was fantastic. From that moment on I was sold on the electric frying pan and its alternatives! So back to the Andrew James 1500 Watt Multi Cooker. This is a large sized multi cooker, and will cook more than enough food for a family of 4. Perfect as an addition to your kitchen, or for a holiday home, and even camping. It is well made and is reasonably priced. The multi cooker tempter can be between 1 and 5. And will heat to temperature and its thermostat will turn the booker on and off to keep the temperature constant. The cooker also cools down quickly when you turn it off. Although the cooker cannot be submerged into water when cleaning, its non-stick interior is easy to clean down with a damp cloth. It does a fantastic job at frying and cooking and will successfully deal with a fry up, fish, paella, risotto and even a curry! The Andrew James 1500 Watt Multi Cooker is great value and does what it says on the box!